Last week we learned about CASTING a hexagram. 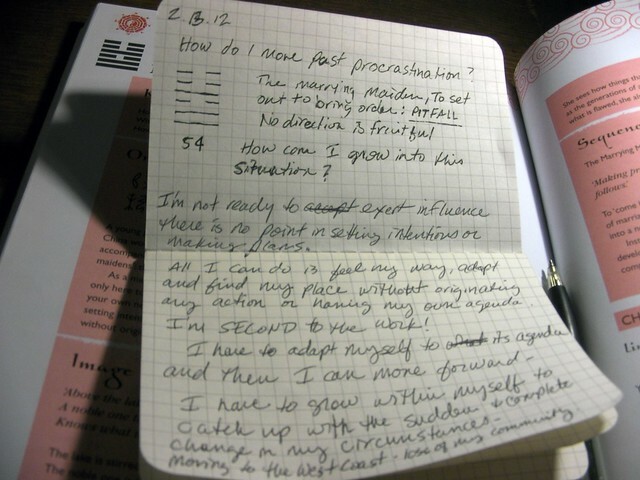 The next step in the I Ching Modern Quilt-along is READING your I Ching hexagram and integrating the oracle's response into your work and life. This includes finding places in the text that resonate, writing your insights down in a journal and then applying them to your original question. The more you throw the I Ching the more you will intuitively sense the interconnectedness of things, actions, and situations. There is a lot of wisdom to gained from this process over time. Marrying Maiden - to set out to bring order: PITFALL. No direction is fruitfal! How can I grow into this situation...of continuing on the quilt I've been procrastinating on? I'm not ready to exert influence. There is no point in setting intentions or making plans. All I can do is feel my way, adopt and find my place without originating any action or having my own agenda. I'M SECOND TO THE WORK! I have to adapt myself to it's agenda and then I can move forward. I have to grow within myself to catch up with the sudden and complete change in my circumstances. Bigger picture issues in my procrastination: moving to the west coast, loosing a sense of community. After asking your question and casting your coins you now have a hexagram. A lower and upper trigram form your hexagram. You can use a chart to find the reference number for your reading in the I Ching. Look up your upper trigram in the horizontal row of this chart and your lower trigram in the vertical column. If you don't have your own text here are some good online resources to choose from: here, here & here. If you cast a hexagram that doesn't change then you read only the main part of the primary hexagram, not the lines. If you throw a changing line you will read the primary hexagram and then the changing line of that primary hexagram and finally you will read the relational hexagram formed from the changing line or lines. If your reading includes changing lines, then you will need to understand primary hexagram, relating hexaram and changing lines together. The two hexagrams in conversation with one another map out your whole answer. The primary hexagram shows you quiet directly what your answer involves. The relating hexagram generally describes what the answer is about for you. It sets the primary hexagram in a broader context. an influence, a direction of travel, an underlying issue - that has to do with you and your relationship to it all. If the two hexagrams map out a landscape for you, then the changing lines stick a pin in that map to say 'You are here!' They are the immediate answer to your question, as the most specific, focused part of a reading. If you throw an unchanging hexagram then it is important to fully understand the concept of the hexagram before moving on. Perhaps you have been ASKING, CASTING and READING the I Ching these past three weeks. If so keep going. Continue to ask your questions, cast the coins, resonate with the readings you receive from the hexagrams and then journal about your surprises and discoveries. Keep a record of all of your castings. Be sure you are marking the changing lines of your hexagrams because you will need this information when translating your hexagrams into a quilt. Ask questions about your creative process for the next couple of weeks. You will want to have completed at least 4 to 6 castings so that you can use this information to design the score or parameters of your quilt. I'll be back with the next step of TRANSLATING our hexagrams into a quilt form in two weeks. This is when the fun begins!